I hope it's no where near as hot where you are as it is where I am. The summer heat is coming on strong here but that doesn't stop us New Yorkers from enjoying the City and all it has to offer! Things have been super busy around here and I just realized that our Featured Handbag in the Spotlight has gone dormant a lot longer than usual. So while you search for a cool breeze, I am going to share a HOT bag with you! I know most people think casual tote bags when summer arrives, but for me, I still have business to do, so while a casual 'summery' tote is what I enjoy during weekends, I need a bag that says business during the week, but won't be too out of place when I attend events in the evenings straight after work. The bag I have been loving pre-summer and so far right through it, is Elliott Lucca's Cordoba Flap Tote in the color 'Teal', exotic . You know how when you first change bags over it takes you awhile to get used to the new one? I didn't experience that with the Cordoba Flap Tote, it's all Fashion and it's just the right size, I also love the inner organizational compartments! I have been wearing my Cordoba Flap Tote in Teal Exotic everywhere, it's laid out in the inside just the way I like it, and there is room for a 'real camera', phone, tablet, sunglasses, and MORE! It's super roomy without being bulky, well organized and I love how versatile it is, it goes just as nicely with a suit as it does with jeans! As you know The Sak, Sakroots, and Elliott Lucca are all sister brands and Sakroots is currently offering a "Choose Your Karma" promotion where you pick your art of choice among a variety of beautiful prints including 'Peace Print', 'One World', 'Flower Power', 'Dreamland', 'Bambu', 'True Love', 'Water Nation', 'TreeHouse' and then you will have the choice to donate to one of the partner charities associated with each print and Sakroots will match ALL donations received! If you pick Peace Print you can help The Nature Conservancy (one of my favorites! As you guys know I am a Wildlife Conservation Society Blogger Brand Ambassador here in New York City), One World styles go to Elephant Nature Park, Flower Power goes to NABA - North American Butterfly Association (and needless to say I LOVE that! ), Dreamland print proceeds can be donated to NPH USA (Raising children. Transforming Lives), Bambu goes to World Bamboo, True Love goes to The HoneyBee Conservancy (as you know they are endangered, and while they can be annoying when they sting you, they serve an important purpose to our eco-system! ), Water nation goes to the Whale and Dolphin Conservancy and last but not least, Tree House style bags go to Plant a Billion Trees! So you can express your style, AND give back which in my opinion is all the more reason to add a new handbag to your collection! Sorry Butterflies we couldn't arrange for a giveaway this time around, but we hope to have Elliott Lucca back soon! Tell us Butterflies, which 'Choose Your Karma' style would you choose and why? 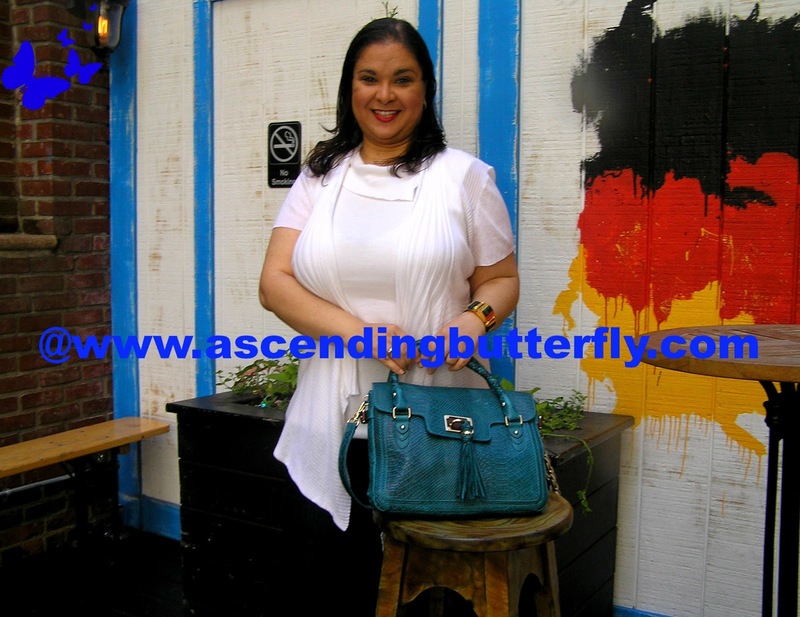 FTC Disclosure: We were provided with the Elliott Lucca Cordoba Flap Tote to facilitate our review, no monetary compensation has been received in exchange for our review. All opinions are 100% my own. See our full disclosure policy for any questions. I'm a big fan of Elliott Lucca bag's and I'm loving the teal exotic your using it is very pretty plus charitable inscentives WIN- WIN !! My choice is Water Nation. @Big Happy Buddha - Great choice! Water nation styles go to the Whale and Dolphin Conservancy!